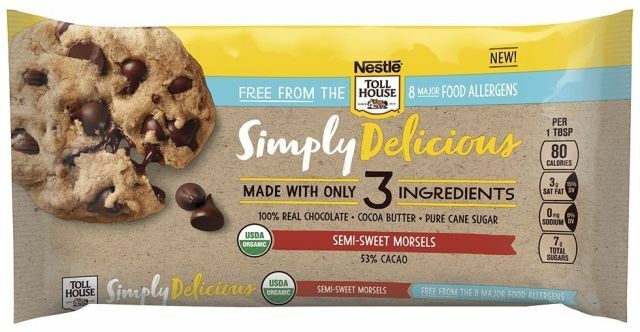 For those looking for chocolate chips that are free of major food allergens and contain very few ingredients, Nestle introduces new Nestle Toll House Simply Delicious Morsels. The chocolate chips are made with cocoa butter, cane sugar, and chocolate and are free of the eight major food allergens (peanut, tree nut, milk, egg, wheat, soy, fish, and shellfish). They're slated to arrive on store shelves nationwide by June 15, 2018 and come in two varieties: Semi-Sweet and 67% Dark Chocolate. The suggested retail price per bag is $4.99. In comparison, the Semi-Sweet Morsels that the Toll House brand is probably best known for is made with sugar, chocolate, milkfat, cocoa butter, soy lecithin, and natural flavors.